Full Circle Espresso Machine Cleaning Tablets are the smartest, most sustainable choice for cleaning your semi-automatic or superautomatic espresso machine. 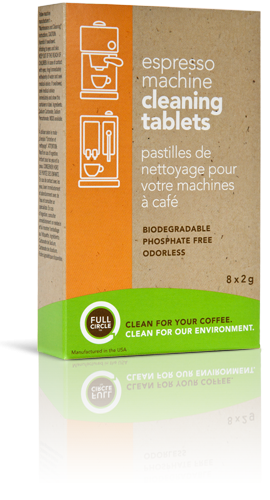 Made of phosphate-free natural ingredients, these tablets are versatile and easy to use: simply drop them into your superauto, or use them in your portafilter to backflush your semi-automatic espresso machine. Make sure to always follow manufacturer instructions specific to your machine anytime you use cleaning products.